Whether you want to change content, presentation, or interaction, you must gain access to an individual HTML element to do it. For example, if you want to change the caption on a button, you must have access to the button first. Think of a physical stream when considering streams in a computer system. In a physical stream, individual atoms of water flow from one location to other along a specific path. Likewise, in a computer stream, individual bits of data flow from one location to another along a specific path. close(): Closes an output stream that was opened using the open() method. open(): Opens a new output stream to receive content from either the write() or writeln() function. write(): Outputs the text you provide to the currently opened stream. writeln(): Outputs the text you provide to the currently opened stream and ends the output with a newline character, which makes the output easier to see when viewing the page source in a browser. 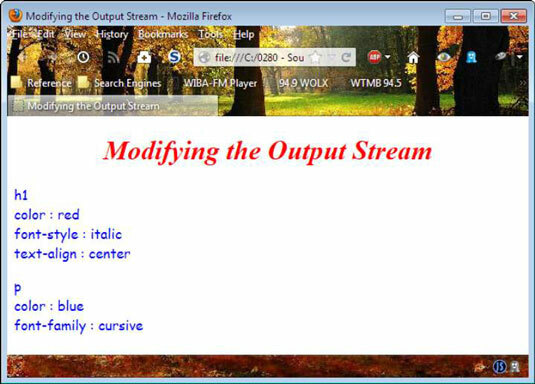 These four functions make it possible to modify the output stream. Here’s an example that combines stream modification with a few other concepts. // Obtain the rules on that sheet. // Display each of the rules onscreen. // of that rule onscreen. // Obtain a list of styles for the rule. // Display each of the styles onscreen. // Obtain the name of a property. // and display both name and value. // End the document rule printout. 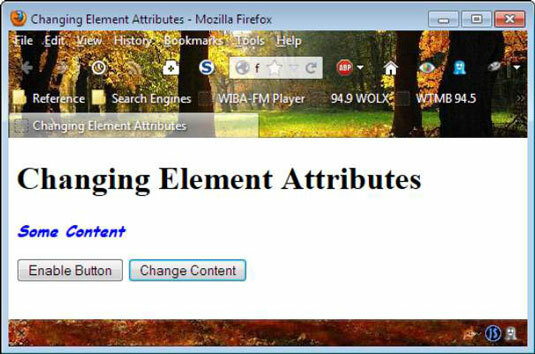 The example document includes a <style> tag that defines the formatting for various elements. Of course, it would be nice to know how the page is formatted. Each <style> tag associated with a page is one item in the styleSheets property, which you can access using an index. This page has only one <style> tag so the code accesses it using the styleSheets index. Each CSS style has one or more rules defined for it, which you can access using the cssRules property. At this point, the example relies on a nested for loop to determine the rule name and each of the styles defined within the rule. A style property consists of a style name and a style value. You must use the style property name to access the value using the getPropertyValue() method. You can use the various methods and properties associated with the styleSheets property and its children to modify styles as well as read them. The whole reason to display a page is to provide content to the viewer. It may seem as if pages are all about formatting, graphics, design elements, and so on, but these items are window dressing for the content that the page provides. The following example shows some simple techniques for changing content on a page. // Modify the <p> tag. // Modify the <input> tag. Even though this example looks simple, it contains everything needed to change content in almost every situation. When working with an HTML element, such as the <p> tag, you use the innerHTML property to make changes. This technique works equally well on <div>, <span>, and <h1> tags. Content: Defines the information that appears onscreen to the viewer. Formatting: Modifies the way that the information appears onscreen. For example, it could add special colors or change the appearance of the font used to display text. Control: Specifies the way in which a user can interact with the content. For example, you can decide that a text box will allow the viewer only to read the content rather than read and write it. Event: Determines the function used to handle the specific event, such as a user click or the change of content. The following example shows how to modify various attributes of a page. // it to change the <p> tag style. This example has two buttons. At the outset, the first button is disabled. To make the button functional, the user clicks the first button, which calls EnableButton(). To enable the button, the code removes the disabled attribute. The caption for the second button is incorrect at this point. It currently says Disabled, so the code also changes the value attribute to Change Content. Now that the second button is enabled and has the right caption, the user can click it. The <p> tag currently uses the default CSS style for that tag. To change the text style, the code adds a class attribute using setAttribute() and sets the value to special. Adding the class attribute automatically changes the text form.